Location: Almuñécar. Overlooking the crystal-clear and calm Mediterranean Sea, is considered one of the prettiest and most picturesque spots of the “Tropical Coast of Granada”, – a mountain landscape rolling down to the sea where avocados, custard apples, mangoes, papayas, bananas and guavas grow. This is only possible because of the exceptional temperatures of the area, between 18ºC (64ºF) in the winter and 25ºC (77ºF) in the summer. Especially famous is the beauty of its sea floor. The town is easy to reach, less than one hour’s drive from the cities of Malaga and Granada. The beauty of the old town which is reminiscent of other cultures and civilizations (Bronze, Phoenicians, Romans, Arabs and Christians) impresses visitors. These cultures and civilizations have shaped the image of a warm and welcoming town. The heart of the old town is laid out with parallel streets radiating from the plateau at the top of the hill, where San Miguel’s Castle dominates the white houses that spread out around it. This programme is available for closed groups for stays of 1 to 5 weeks all year round. These courses are taught in all levels, from beginner to advanced. On the first day the student will be placed in a group of his/her level after being tested in the four skills (listening, speaking, reading and writing). 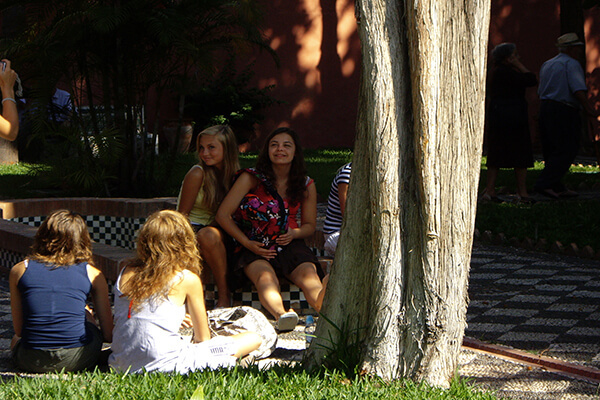 The teens programme includes 20 weekly Spanish lessons from 9:30 a.m. to 13:00 (1 lesson = 45 minutes), homestay or hotel accommodation on a double/triple room, 1 full day excursion per week, 1 half day excursion per week, a supervised programme of games, leisure activities & evening entertainment, local taxes on accommodation/excursions, city tour and laundry every week. One group leader can accompany each group of 15 students for free (one free leader place per 25 paying students at Hotel).